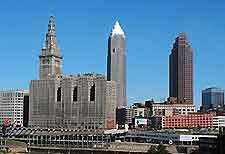 Summer marks the high season when it comes to accommodation in Cleveland, with hotels being at their most expensive. However, don't be overly alarmed, since lodging in Cleveland is generally very affordable anyway, and hotels tend to increase their prices by no more than 20 percent at most. Also of note, if there is a major event or busy convention taking place in Cleveland, the demand for accommodation rises accordingly, along with the price. 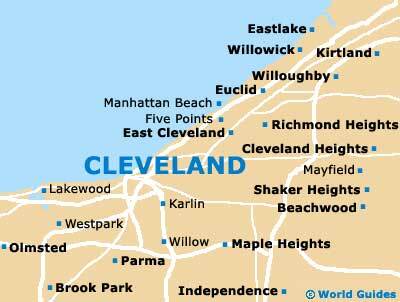 There are several hotels close to the Cleveland Hopkins International Airport (CLE), which is only some 10 miles / 16 km south of the city center, in the Riverside area and close to the Rocky River Reservation. Nearby airport accommodation comes in the form of the onsite Sheraton Hotel on Riverside Drive, and both the Airport Plaza on Brookpark Road, and the Hilton Garden Inn on Emerald Court. Budget hotels in Cleveland tend to be concentrated around Brookpark Road, Engle Road and West St. Clair Avenue, amongst other roads. Much of the cheapest accommodation understandably stands outside of central Cleveland. The University Hotel and Suites on Euclid Avenue is especially well-placed in the Midtown district, being very close to the Cleveland State University and no more than 4 miles / 6 km from most tourist attractions, such as the Rock and Roll Hall of Fame and the Browns Stadium. If you are a backpacker looking to save as much money as you can and prepared to commute, then consider staying at the HI Stanford House. This budget accommodation option really is cheap, partly due to its location, since the HI Stanford House stands approximately 22 miles / 35 km to the south of Cleveland, in the nearby village of Peninsula and nestled within the Cuyahoga Valley National Recreation Area. Also close by, the nearby towns and cities of Brook Park, Brooklyn, Fairview, Independence and Lakewood all come with their own set of affordable hotels and are well-connected by public transport. 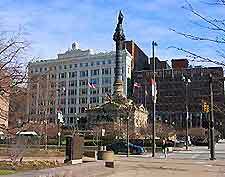 Some of the most popular mid-range lodging areas of Cleveland include Euclid Avenue, Public Square and Prospect Avenue. Notable mid-range accommodation available in the city includes the Radisson Hotel on Huron Road, opposite the Quicken Loans Arena, and the Hilton Garden Inn on Carnegie Avenue, which is located alongside the Progressive Field ballpark (home of the acclaimed Cleveland Indians baseball team). With views of Lake Erie, the Crowne Plaza City Center on St. Clair Avenue lies in the downtown Financial District, near to the Browns Stadium, while on Euclid Avenue, the Wyndham at Playhouse Square is based within second-biggest theater complex in the USA (after only Broadway in New York), being just a stroll from the Allen, Hanna, Ohio, Palace and State theaters. 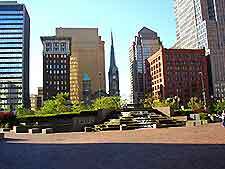 Luxury accommodation in Cleveland mainly comprises a handful of four-star hotels, such as the downtown Ritz Carlton on West 3rd Street, the Renaissance on Public Square, and the InterContinental on Carnegie Avenue, which is linked to the Cleveland Clinic (medical center) by a short walkway. A particularly top-end lodging option is the Hyatt Regency Hotel at the Arcade on Superior Avenue, which is a magnificent 1890 building, complete with period details and a huge interior skylight.